Think of a colon (:) as the language version of an equals sign (=) in mathematics. 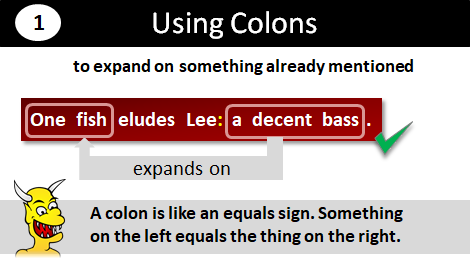 The information on the left of the colon equals the information on the right. He blamed his divorce on one thing: beer. There are two reasons why I don't believe the alibi: there is no visa in his passport, and he is petrified of flying. I have made an important discovery: it's my first important discovery this year. The Victorian printing set is missing the following characters: Q, R, K, and the question mark. Note: You cannot use a semicolon (;) for this purpose. I am currently reading "How To Get Your Own Way: Who's Manipulating You?". Genesis 1:1 starts "In the beginning God created the heavens and the earth." It's hard to disagree with Frank Zappa, who said: "Art is making something out of nothing and selling it." I need one personal trait: discipline. I would like to change just one aspect of your draft: the words.